constantly upgrade their respective products only to suit their customers’ wants. Apple who is famously known for her incredible technology production is not left out of this. Since the introduction of the first generation of iPod in the year 2001, several other series have been launched by Apple. This led to the introduction of the fourth generation of iPod which is popularly known as the iPod Touch 4. 1.2 However, all of these aforementioned features couple with its flexibility and durability makes iPod Touch 4 a necessity for some many people. 1.3 This is a better way of getting your device repair than taking or sending it to the Apple office for repair. 1.4 Finally, people in Sydney and its suburbs can go to them for a local service at any time of the day. 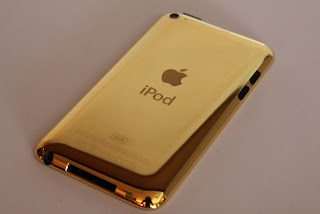 1.5 Have you seen 'Real 24ct Gold iPod Touch' ever before ? 1.6 It's Available For Our Customers Only. 1.8 please click here to see '24ct Gold iPod Touch'. who had by one way or the other been tired of their old version of the device. As a result, they really longed for a much more high-tech device that allows multi-tasking. The previous generations of the iPod Touch though have a lot of amazing features that do interest the users, but the iPod Touch 4 is a bit more advanced in features and much flexible than its prototypes. It embodied those features that were left out of the former generations and also it contains the improved version of those that were present. However, all of these aforementioned features couple with its flexibility and durability makes iPod Touch 4 a necessity for some many people. It is a must-carry-along device to different places for them, thus making the device very much vulnerable to series of damages especially screen damage. As the screen of the device covers the front side of it, just an accidental drop of the device on the ground can damage or crack the screen. Whenever any of the accidental damages that is beyond your possible control happens to your iPod Touch 4, the best way to go about it is to look for a company that is specialize in the repair of the different kinds of iPod generation that exist. This is a better way of getting your device repair than taking or sending it to the Apple office for repair. This could take longer than necessary time before you can get your device back. Also it might even cost you almost the exact amount you get the device. As a result, it is wise to employ the service of a repair company which can perfectly fix your device in a question of hours or at most a full day. The company I am talking about is known as the iPod Repair Sydney Specialist. It is a local business outfit at Sydney in Australia which is one of the members of Apple Repair Specialists Alliance across the world. It is specialize in the repair of the different part of iPod. For instance, the iPod Touch 4 Screen Repair, iPod Touch LCD Repair, screen replacement, battery replacement, iPod 4g glass replacement, iPod jack repair amongst several other repairs. If the damage to your device is cracked screen, the company has experts who iPod Touch 4 Screen Repair is their forte. Finally, people in Sydney and its suburbs can go to them for a local service at any time of the day. In the same vein, you can reach them online if you are not in Sydney or Australia. They will do your iPod Touch 4 Screen Repair with only a toke amount. Try them today.